Are These High-Yield MLPs Worth the Risk? Some companies offer high yields and a diversified asset base, but many high-yield companies carry a well-deserved risk premium. Higher-yielding companies pay out more cash to shareholders, but they can also be more volatile. The only way to see if a high yield is worth the risk is to peek under the hood and see how the business operates. A number of energy MLPs offer mouthwatering yields, but only a few are good deals. 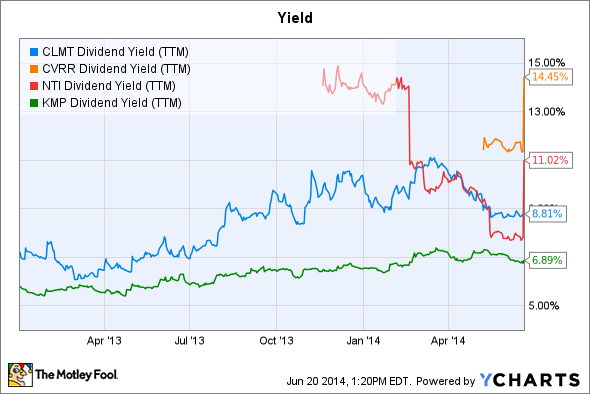 CLMT Dividend Yield (TTM) data by YCharts. Risk management is a critical part of investing. Diversification can increase a portfolio's return with limited impact on its expected risk. A company with diversified assets and markets similarly limits its exposure to unforeseen events. Calumet Specialty Products Partners (NASDAQ:CLMT) has a relatively small $2.2 billion market cap, but it spreads out its refining among 14 geographically diverse facilities. Calumet's fat margins in the specialty product markets help to decrease the impact of volatile spreads in the fuel markets. With specialty products accounting for 33.5% of first-quarter 2014 sales, Calumet has a good degree of insulation from the commoditized fuel markets. The company's high 8.8% yield comes from its 2013 difficulties, as refinery turnarounds and spiking RIN costs hurt income. But its San Antonio refinery expansion and other growth projects helped boost its distribution coverage ratio from 0.51 in the first quarter of 2013 to 0.94 in the corresponding period of 2014. Last year left a bad taste in the market's mouth, but Calumet Specialty Products Partners is proving that it can grow in a sustainable fashion. Calumet is not the only diversified MLP with refinery operations. Kinder Morgan Energy Partners (UNKNOWN:KMP.DL) is a vast midstream firm with assets strewn throughout North America. To get around America's ban on raw crude exports it is building a $360 million splitter on the Gulf Coast that will be fully operational by second quarter 2015. Kinder Morgan Energy Partners' yield of 6.9% is not the highest available. The upside is that the company offers a trailing 1.09 distribution coverage ratio, stability and diversity that are seldom found in pure-play refineries. CVR Refining (NYSE:CVRR) operates two refineries, and Northern Tier Energy (UNKNOWN:NTI.DL) operates one refinery. CVR Refining's yield of 14.5% and Northern Tier Energy's yield of 11% are tantalizing, but there are signs that these highly concentrated companies deserve a risk premium. CVR Refining attempts to reduce risks related to its concentrated asset base. It can handle 25,000 barrels per day (MBPD) of heavy sour crude. By basing its two refineries in Kansas and Oklahoma it has good access to developing shale plays throughout the Midwest. The problem with operating two refineries in a single region is that CVR Refining's income is subject to the market. The company has little power to shield investors from falling crack spreads. Through acquisitions it may diversify and bring structural stability, but for now it remains a small and volatile Midwest refiner. Northern Tier Energy is even more concentrated. Along with its lone refinery, it owns a number of convenience stores and a 17% interest in a 455 MBPD pipeline that connects its refinery to Enbridge's mainline. At the end of the day, Northern Tier Energy is a pure refinery play. In first quarter 2014 its retail operations brought in $1.6 million in net income, while its refinery segment delivered $97.8 million in net income. Last year, a fire broke out at Northern Tier Energy's refinery. The repair operation cost $3 million, and the refinery's throughput was reduced. That is a notable expense for a refiner with $27.2 million in third quarter 2013 net income. Also, over the long term Northern Tier Energy is exposed to tightening Canadian crude spreads as pipelines are built to the West Coast. This company's high yield is attractive, but unforeseen events can easily have a material impact on its distributions. Risks and returns are intimately connected. While Calumet Specialty Products Partners' high yield is related to temporary issues, CVR Refining's and Northern Tier Energy's concentrated assets put more risk in their distributions. Investing in Kinder Morgan's new splitter or Calumet Specialty Products Partners' diversified mix of specialty products is a safer way for income investors to profit.